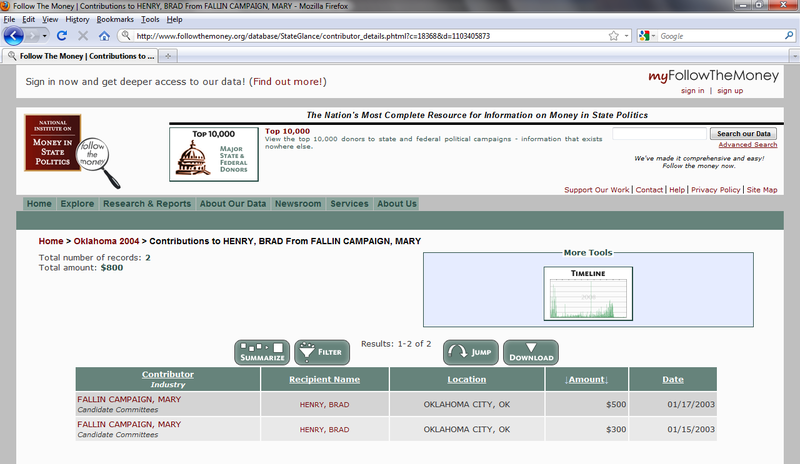 After I looked up Janet Barresi and Shawn Hime's campaign contributions, I decided to take a look at some of the other state-wide candidates' donations. One of the things I found surprised me. 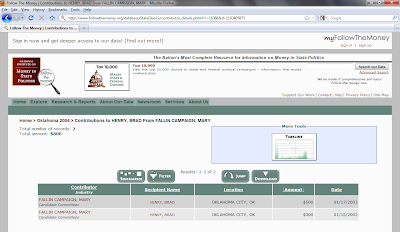 FollowTheMoney shows the transfer as taking place in January of 2003. However, I have been unable to confirm that through the State Ethics Commission website, which does not have records from back that far still online. UPDATE 2: Follow The Money has since corrected the error. They said in a statement I obtained, that "It appears that the error happened because the paper report [that they had ordered, since the state Ethics Committee doesn't have that information online] had the cover page for his reelection committee on top of the contributions for the inaugural committee. Regardless of the cause, we will correct the error."